REDDING — The bodies of a great-grandmother and two young children, reported missing soon after a huge wildfire began its push into Redding two days ago, were found Saturday in the ashes of their home. 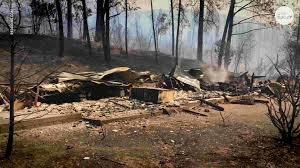 Two young children and their great-grandmother are the latest victims of a massive and fast-moving wildfire in Shasta County that officials acknowledged Saturday they were making little progress in controlling. Melody Bledsoe, 70, and her great-grandchildren, Emily Roberts, 5, and James Roberts, 4, died when their Redding home burned Thursday night, according to their family. The death toll from the blaze known as the Carr fire stands at five with more than a dozen other residents reported missing. Family members had mounted a desperate search for Melody Bledsoe and her great-grandchildren, Emily Roberts, 5, and James Roberts, 4, at shelters and hospitals. They were ultimately summoned to the Shasta County Sheriff’s Office, sobbing and hugging as they entered the building, to hear the news. The family said authorities told them the 4-year-old had called 911 from the house. The aggressive blaze, fueled by winds and scorching temperatures — it was 104 in Redding on Saturday — nearly doubled in size from Friday. By Saturday evening, it had grown to 83,800 acres and was only 5 percent contained, according to the California Department of Forestry and Fire Protection. On Friday, the fire was 48,312 acres.